feeling stitchy: Embroidery Companion, Your Stitchy Friend. Thanks for the book review. I'll have to check it out! I love that book! First I checked it out at the library and I loved it so much, I had to go and buy it! My husband got me this book for my birthday, (enscribed by Alicia herself - squee!!) I love it as well! It's one of my favorites for sure. So far I've made a few of the cookies from the mobile, but I didn't make a mobile, I made ornaments for family for Christmas. They were a big hit :o) I'm really looking forward to making the blackwork project. I love this book, I made the tree hot water bottle cover and the quilt with the farm animals on for Christmas presents, both worked a treat. 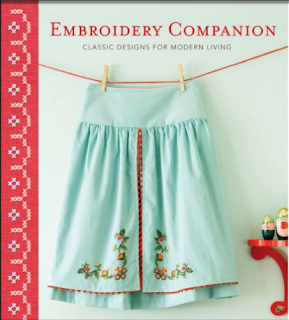 I am always looking for an inspirational stitching book. Thanks for the recommend. I'm going to take a look at it. Sounds so nice, tea and thread... Can't wait to seek this book out. I've seen this book on amazon and been wondering if it was worth it, thanks for letting us know it is!